1. T-37 RC CLASS RULES AND OBJECTIVES - All boats and parts shall be manufactured by Tippecanoe Boats and distributed through their distribution system. All design changes to boat hull, sails, and rigging shall be made by Tippecanoe Boats. The primary objective of limits on the one-design T37 class is to make all of the boats evenly matched for exciting and fair sailing competition. In one design racing, it is the skill of the sailor that should be the only factor that materially influences the outcome of the races. Other objectives of the limits are to keep the boats seaworthy, strong, durable and affordable. Except for the Racing Upgrade Kit from Tippecanoe Boats, any modifications that involve significant changes to the boat or involve significant cost are not allowed. Any changes that affect the weight or shape of the boats are not allowed. Any changes that would make earlier boats obsolete or less competitive will not be allowed. 2. WEIGHT - The minimum allowable total sailing weight for the T37 with batteries on board is 5 pounds. Additional weight to bring the boat up to 5 pounds must be added inside the boat hull. Sailing weight of a boat above 5 pounds is allowed. 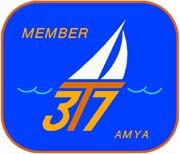 Specific provisions concerning the adding of additional weight may be determined by the local sailing club or in the Sailing Instructions for any regatta. 3. HULL - The hull must be constructed according to the instructions provided with the T37 Kit except as allowed for in these Class Rules and from the materials provided with the kit from Tippecanoe Boats, although additional materials can be added. The thickness and dimensional shape of the two sides and bottom panels cannot be changed. The rounding of the chine cannot extend upwards or across the bottom more than 1/4 inch. The transom panel must remain the same thickness. Creating additional rake to the transom or changing the transom shape is allowed but not so as to create a different distribution of weight in the boat and not so as to change the overall length of the boat. 4. DECK - The deck must be used as supplied in the kit, with no changes in the thickness or dimensional shape or, if a custom deck is created out of other materials, the custom deck must be the same shape as the deck that is supplied with the kit and must weigh the same or more than the deck that is supplied with the kit and must be a uniform thickness throughout. 5. SAILS - The sails must be the standard sails provided by Tippecanoe Boats. No changes to a standard sail are allowed. Reefing a sail is not allowed. Battens and telltales may be added to the mainsail and the jib. The jib must be mounted on the forestay by means of the forestay being slid through the sewn luff sleeve of the jib. Sail numbers shall be the four-digit hull number, not less than 3 inches tall, bold block numbers in a starkly contrasting color. Recom-mended that the starboard number is higher than the port and separated by an inch vertically. 6. BALLAST / KEEL FIN - The ballast casting must be used as supplied by Tippecanoe Boats without any changes in size, material or weight. The bolt holes and other gaps in the keel casting may not be filled with any material heavier than epoxy. The keel fin and ballast bulb must retain their profile as supplied by Tippecanoe Boats. No fairing can be added to the bulb ends in an effort to smooth water flow or for other reasons. The keel bulb may be coated with epoxy or other protective coatings. The keel fin must have a minimum thickness of .220 inch ( approximately 7/32 inch) for 1/4 of its chord length from front edge to back edge at every point from top to bottom. The keel fin chord thickness may be increased using only thickened epoxy and wood. Fiberglass cloth or carbon fiber not thicker than .05 inch may be used on the outside of the keel fin or between the two halves of the keel fin. Adding significant weight to the keel by thick applications of fiberglass cloth or other synthetic materials is not allowed. The keel must be fixed and not movable. The keel must be assembled as directed in the assembly instruc-tions regarding any factors that might affect the final depth of the keel. Attempts to make the keel deeper by techniques such as the following are not allowed: sanding down the tabs at the top of the keel, changing the position or size of the bolt holes in the wooden keel fin, not aligning the keel castings with the bulb shape of the plywood keel, not using the stainless steel bolts and nuts as provided in the kit to hold the castings in place, changing the bolt holes in the zinc casting. The fiberglass complete keel provided by Tippecanoe Boats is permitted. 7. RUDDER - The top 4 inches of the rudder must have a continuous minimum thickness of 1/8 inch at some point in its fore and aft chord. The rudder depth measured from the top edge of the rudder blade to the bottom edge of the rudder blade must be between 6 inches and 6.5 inches. The rudder shall be a single blade, symmetrical port and starboard, and bearing no appendages. Otherwise, the rudder profile can be shaped as the builder pleases. The rudder may be made from any material other than metal. The rudder shaft can be made from any material, as long as it is at least 3/32 inch in diameter. Rudders cannot be switched between races. There can only be one rudder on a boat. 8. MAST / BOOMS - The mast material can be wood or carbon fiber, untapered, and not less than .240 inch in diameter. The mast can only be supported with two shrouds, a backstay and a forestay. Spreaders may be added to the rig. The mast position at the deck must be fixed and not movable. A fixed or manually adjustable main boom vang may be added. If the boom vang consists of a solid piece of material generally filling in the triangle between the bottom of the boom, and the mast, this triangular shape cannot extend back along the boom more than 2-1/2 inches so as not to effectively add to the sail area. The largest boom cross-sectional dimension cannot exceed 3/8 inch, so as not to effectively add to the sail area. The forestay must be attached directly to the bow deck or to the jib boom, in which case the jib boom must be attached to the deck at any point along the forward third of the jib boom. The mast height measured from the deck to the top shall not ex-ceed 45-3/4 inches. A jib boom counterweight may be added, but it shall not extend beyond the bow. 9. RIGGING - Shrouds and backstay may be of any material. The forestay must be nylon tubing as supplied with the T37. The shrouds and backstay may be rigged in such a way that they can be easily detached and re-attached for ease of taking down the mast for transportation. The shrouds and backstay can be designed so that they can be adjusted by hand. The port and starboard shrouds and their attachment hardware may be omitted if a carbon fiber mast is used. Topping lifts may be added to the booms. Raised sheet fairleads and barney posts may be added. Minor rigging changes that can be added to any boat easily after it has been completed will generally be acceptable. 10. SERVOS - A higher torque servo may replace the standard sail sheet servo or the rudder servo, but both servos must still be mounted on the top surface of the RC control platform and must not extend vertically above the top surface of the deck. A double throw pulley system can be incorporated into the sheeting system to increase the range of motion on the mainsail and the jib. A sail winch is not allowable. The RC control platform must be positioned as shown in the assembly instructions and cannot be set lower in the hull to accommodate a larger servo or to get the weight of the servos and batteries lower. The batteries must sit on the top surface of the RC control platform. 11. HATCH COVER - Any design for a hatch cover or cabin structure that does not significantly affect performance is allowed. 12. WIND INDICATORS - Mast head wind indicators are allowed. 13. CHANGES - Questions concerning minor changes to individual boats and interpretations of the rules as they might apply to individual boats should be directed to the T37 Class Secretary to be decided by the T37 Class Secretary and by Tippecanoe Boats on an individual basis. Any decision will be made on the basis of the change not having any substantive effect on the speed or competitive potential of the boat and as being in keeping with the intention of these class rules as stated in Section 1. Contact Will Lesh, 1-800-206-0006 or fun@modelsailboat.com or by mail at 4305 Nordum Rd. Everson, WA 98247. 14. CLASS RULES CHANGES - These Class Rules are subject to modification as the need arises. No changes will affect any of the provisions or the basic objectives of the class rules as stated in Section 1. Any proposed alterations to these rules must be submitted to the T37 Class Secretary and Tippecanoe Boats for their consideration. Address all questions to T37 Class Secretary Will Lesh, 1-800-206-0006 or fun@modelsailboat.com or by mail at 4305 Nordum Rd. Everson, WA 98247.